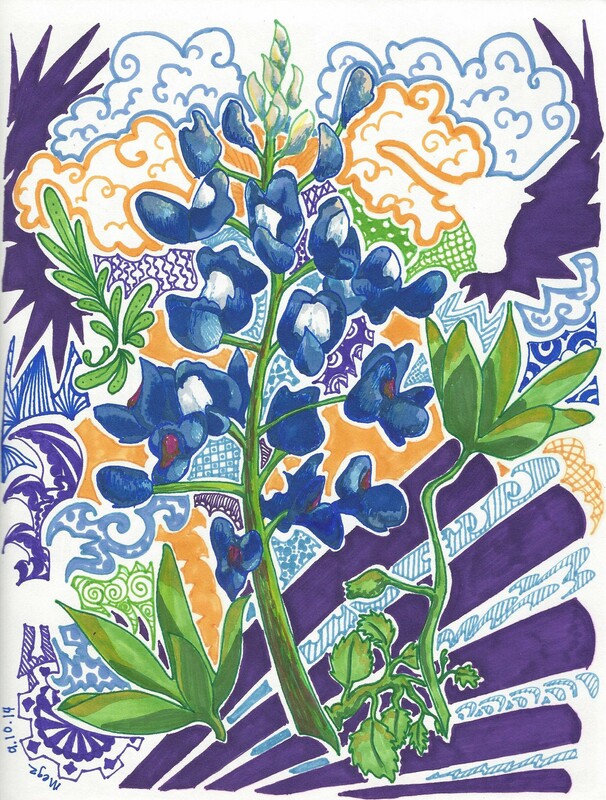 I’ve finished another addition to my State flower collection: Texas. Fans of Texas are sure to be well-acquainted with the state flower, the Bluebonnet. My brother’s family lives in the Austin area, and they make a yearly trip to fields full of bluebonnets for their family portrait. They are a vivid flower and are surprisingly dainty for a state that is renowned for bigger and better everything. You’ll also notice I have placed another negative space motif in the corner to pay tribute to everyone’s favorite Texas bovine, the longhorn. I would like the extend my condolences to the Longhorns, as I myself am a BYU fan. Better luck next year! Next up is Indiana or Georgia. We shall see, both of their state flowers are white. Hmmm.